Here is my Burning Man project for 2015. It consists of a board 70 inches wide mounted on a wide-base tripod that can withstand very high winds without tipping over. 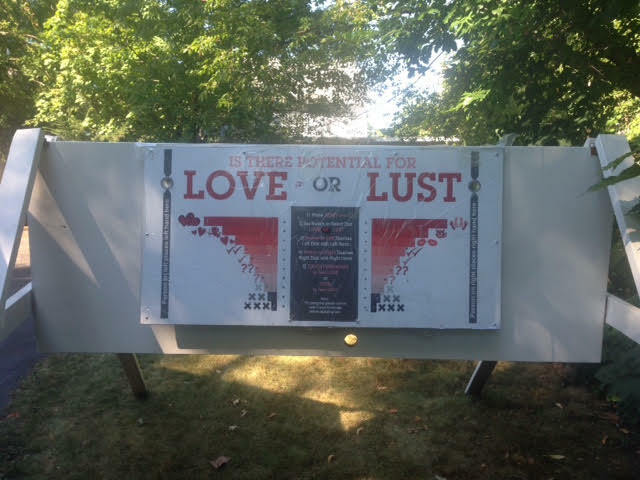 On one side is an electronic game consisting that tests “Love” and “Lust” A couple each touch one hand to a metal plate and then touch each other. Lights flash and a buzzer buzzes and eventually the lights settle down indicating the level of love or lust between the two. On the other side is a “Live by Design” card game. Players flip over cards revealing interesting questions worth discussing and they try to match the color and number on each card to win points.